You'll be £19.99 closer to your next £10.00 credit when you purchase Devotion to a Calling. What's this? Harley Boxall was awarded his RAF wings on 3 October 1936 and was posted to 40 Squadron flying Hawker Hinds. On 1 April1937 he was posted to Bircham Newton in Norfolk to train with 206 Squadron which was a General Reconnaissance and Training unit equipped with the Avro Anson. He then joined 62 Squadron shortly after it was formed and received its first Blenheim in February 1938. During the summer of 1939 and because of increasing political tension in Europe, a decision was taken to reinforce the Far East Air Force with two squadrons of Blenheims. The urgency of the situation required that the aircraft, from 34 and 62 Squadrons, be flown out to their final destination at Tengah in Singapore. It took a total fifty flying hours to arrive. On Thursday 4 April 1940 a signal came through from Air Headquarters that aircraft were to make a reconnaissance of Sabang Harbour and photograph any shipping therein. Five Blenheims took-off from Alor Star at 1030 and on leaving Sabang behind at 1300 hours, Boxall climbed to gain height for the long return sea crossing. He had gained an altitude of 9,000 ft. when, some forty miles from the coast of Sumatra, the oil pressure of his starboard engine fell to zero. Within a minute or so, the port engine seized and he was flying in silence. After a successful crash landing on the sea the crew waded through the coral, heedless of the cuts inflicted, and fell exhausted on the beach. The island was roughly two miles long by one mile across, rising steeply from the shore to a height of about four hundred feet and covered with thick jungle down to the water’s edge. By the morning of the third day they had been forty-eight hours without food. They wondered along the beach and collected more wood and ate unripe ‘plums’. It was not until the sixth day that a small native boat came silently round the edge of the mangrove heading for the beach, eventually rescuing the crew. In September 1940 Harley was promoted to flight lieutenant and given command of the RAF Station at Alor Star in Malaya. 62 Squadron flew on what Harley later described, as the first and only operation that it carried out as a unit, when he lead eleven Blenheims to bomb the Japanese invasion fleet. Against the odds, all of 62 Squadron’s aircraft and crews returned to Alor Star safely but approximately half-an-hour after they had landed and while the Blenhiems were still being rearmed and refuelled, the Japanese attacked the airfield. A force of about twenty-seven enemy aircraft bombed Alor Star completely destroying at least three Blenheims and rendering another three damaged and unserviceable. As the Japanese invasion spread Harley finally escaped from Java on 2 March aboard the ‘Tung Song’ , it was one of the last ships to leave. Harley Boxall is now deceased. Joe Bamford is an ex-air traffic controller and a keen aviation historian. He lives in Keighly. 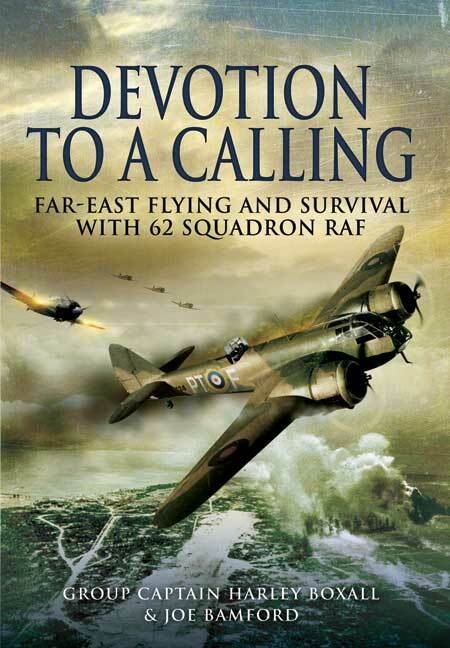 This is an interesting memoir, providing a different view of the pre-war RAF, and a rare view of life in a Blenheim squadron in the Far East during a time of great uncertainty.